Employing an architect is a not a decision to be taken lightly and, as a prospective client, you need to know that you are in safe hands, and that you can trust your architect to guide you through your building project and deliver excellent design in tune with your needs and wishes, as well as top quality construction through careful appraisal of the contractor and attention to quality control during the build, good management skills of time and money, a professional attitude, personal attention and clear communication with you and other parties they will have to deal with on your behalf. Martin Architects was established in 2009 by Philip Martin and was joined in 2010 by Margaret Martin. Prior to setting up their own practice, Philip and Margaret both worked with leading architectural practices abroad and in Ireland, developing a valuable and varied portfolio of design work and project management skills, including projects in the following fields: Mixed-Use, Commercial, Interior Fit-Outs, Educational, Healthcare, Transport, Community Projects, Residential and Protected Structures. Martin Architects has to date been involved mainly in commercial and residential work, and we are now interested in expanding our own portfolio in these and other sectors. 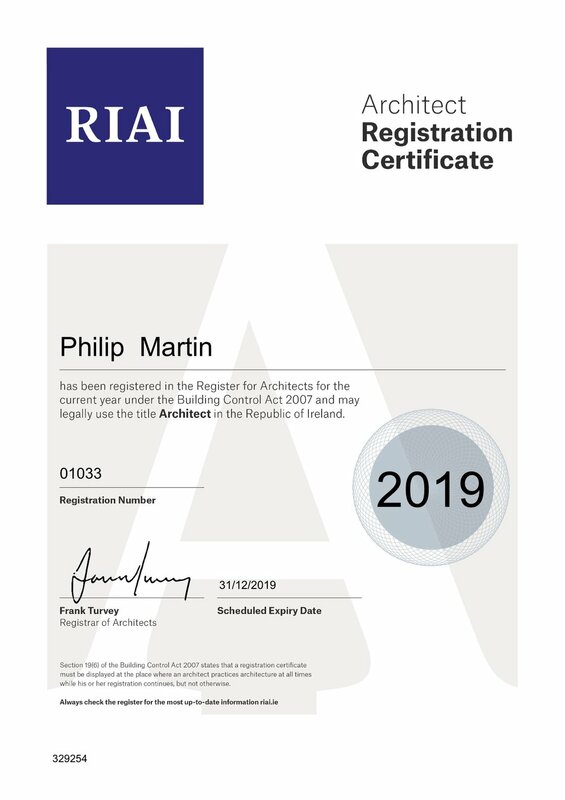 Margaret Martin is accredited in Conservation by the Royal Institute of Architects of Ireland to Conservation Grade III. Martin Architects carry Professional Indemnity Insurance. Our clients needs and aspirations are, of course the driver of every project. Every client and every site is individual and unique and we begin each project without preconceptions as to how the end product should be. Ultimately what we want is for our clients to feel that they have been in safe hands, that they have been given all they had wished for and more, and that they are nothing less than delighted with our work. We want our designs to deliver the full potential of their site, to be beautiful, well detailed, cost effective and fully compliant with Building Regulation standards, delivering high quality construction that will stand the test of time using sustainable materials. You may or may not have a clear idea of what you wish to achieve at the beginning of a project. We are always delighted when a client presents their own sketches and concepts. We relish the challenge of interpreting your ideas and we always present some of our own ideas, to ensure that all the best options for you are considered at the outset. Clear communication between all parties is the key to any successful building project. Remember that nothing speaks louder than an image, to an architect in any case, so it is enormously helpful to have images to discuss, to set the project off on the right track. We also understand that many of our clients are working and lead busy lives, and to this end we can and do meet many of our clients outside of office hours. Try to get a feeling for what you wish to achieve by collecting images from magazines, books, newspapers, online etc. Analyse what it is about a particular image that appeals to you. It might be the sense of space, the materials, the views, the lack of clutter, the colours, the architectural detailing, the modern or classic styling etc. Would it be possible to achieve something similar in your project, given the constraints of budget, building regulations, planning permission, or available space? It is also very helpful to assess images that you find unappealing and communicate the reasons for this to your architect. Try to visit as many buildings as you can of a similar nature and look carefully at the elements that make them successful or otherwise such as ceiling heights, doors and windows, decor, layout, storage areas etc. Is the plan organised in a way would suit your circumstances? There may be reasons why some ideas may work and be successfully incorporated, while others may not, for example, the idea may be overly expensive to build or may not comply with building regulations. We will do our best to achieve the best possible solution for you. How do you anticipate your building will be used in years to come? Should you allow for rooms to be easily adaptable?